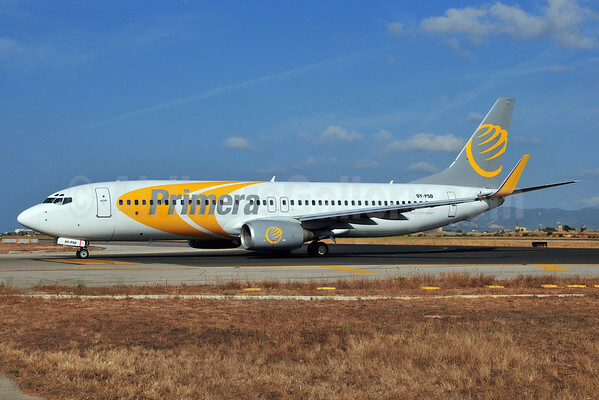 Primera Air (Scandinavia) (Copenhagen) is opening up new routes for the current winter season. On October 26, the company launched weekly service from Gothenburg and Malmo to Dubai (Al Maktoum), Helsinki to Fuerteventura and Las Palmas and from Malmo to Tenerife Sur. Furthermore, late this month, the airline will start four new weekly routes; Aalborg-Las Palmas (December 19), Copenhagen-Billund-Lanzarote (December 19), Aarhus-Tenerife Sur (December 20) and Aalborg-Fuerteventura (December 22) per Airline Route. In other related news, Primera Air (Iceland) (Keflavik) launched a new route to New York (JFK) on November 16 after acquiring rights to serve the United States. Copyright Photo: Ton Jochems/AirlinersGallery.com. Boeing 737-86N OY-PSD (msn 28618) taxies at Palma de Mallorca. This entry was posted in Primera Air (Iceland), Primera Air (Scandinavia) and tagged 28618, 737, 737-800, 737-86N, Aalborg, Aarhus, Billund, Boeing, Boeing 737, Boeing 737-800, Copenhagen, Dubai, Fuereventura, Fuerteventura, Gothenburg, Helsinki, Keflavik, Lanzarote, Las Palmas, Malmo, New York, OY-PSD, Palma de Mallorca, PMI, Primera Air, Primera Air (Iceland), Primera Air (Scandinavia), Scandinavia, Tenerife Sur on December 7, 2014 by Bruce Drum.